Does WIC program support Epson PX660 printer? Sure! 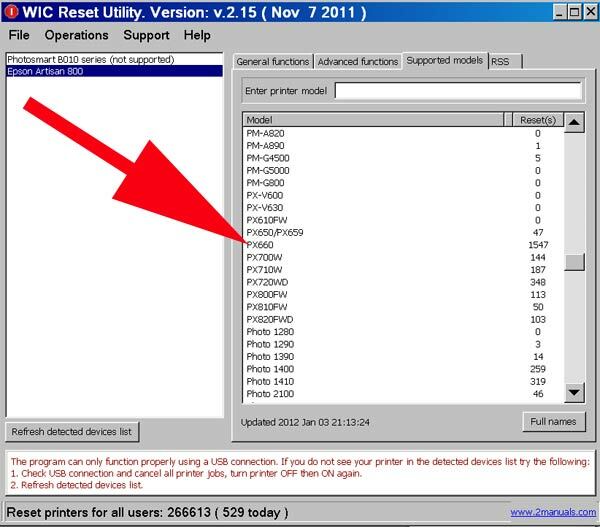 The WIC Reset utility supports Epson PX660 printer model. You can check supported printers list in WIC program. La tua stampante Epson si ?? fermata e ti chiede di rivolgersi in assistenza per sblocco contatore del tampone? Hi! I have used wicreset trial code and now my print was successful reset. I ask you: my printer now is ok or the counter is not 0 but 90% ??? I have read counter and i read 0 value. I have also now to buy the reset code ??? I d'nt have urdenstand very well if now with trial the total counter is now at 90% at total life of my printer or at 0% (new). Thank's for your reply.